Two types of windows are most popular in Poland: opening windows and tilting windows. However, why not install sliding windows?! The leaves of smaller windows can be slid upwards and downwards and the leaves of bigger windows can be slid sideways. Windows which open vertically are popular mainly in Great Britain and in the USA. They have a classical form and their atypical structure allows for unrestrained interior design. Their functionality and original appearance win them fans even in Poland. Such windows must be equipped with special ROTO Vertical Sliding hardware with a spring which makes it possible to slide the window leaf vertically and – potentially – to tilt it. Such technology allows for easy up-and-down sliding movement within the frames of glazing. Without the tilting function they can weigh max. 65 kg, with the tilting function – 35 kg. Depending on the window leaf weight, suitable springs are adjusted individually. It is also possible to order them with a special “horn”, which makes them look “old-style”. Large-size windows, also used as patio doors connecting the house with the garden, are extremely popular, almost obligatory, in the south of Europe. 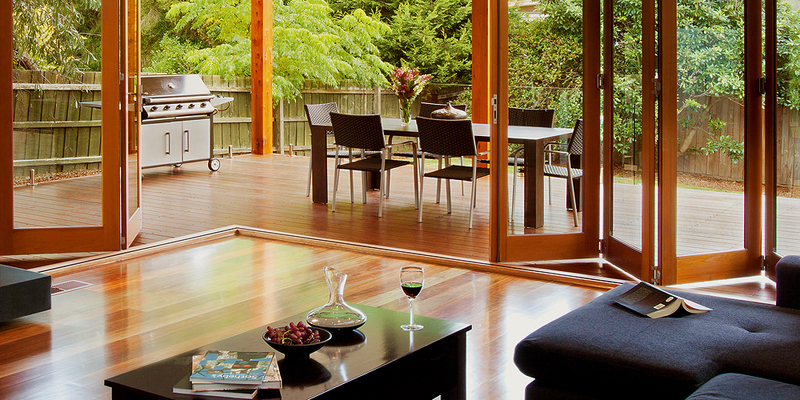 Folding doors are the ones most commonly chosen – they can be opened wide in warm seasons. Window glass-panels applied in folding doors are heavy, so they must be equipped with special hardware to open and close easily in case a storm breaks out. Infallible and comfortable exploitation of all functions of folding doors with a low doorstep is ensured by Weatherfold 4S hardware provided by ROTO Company. This hardware is designed for leaves which open inwards and outwards, of max. weight: 50, 75, 100 and 150 kg, height: 4000 mm and width: 1200 mm. They can possess profiles 44-68 mm thick made of wood or aluminum or a combination of both. The “accordion-like” effect of folding doors is achieved by putting together max. 16 leaves (8 leaves on each side). In the fully folded position folding doors can provide a doorway of a truly impressive width of 19 meters! Folding doors of that size will best fit in a spacious mansion or a winter garden.